See below to learn what were said in the role play. มิ้ง จะไปไหนอ่ะ /Mink, jà bpai năi à?/ Where are you going? – The question word ‘where’ in Thai is ที่ไหน /tîi-năi?/, but in spoken Thai when it is used after the word ไป /bpai/ we commonly just say ไหน / năi/? – อ่ะ / à/ is an informal particle used to put at the end of a statement and question. จะไปเที่ยวทะเลกับสาวอ่ะ /jà bpai tîao tá-lay gàp săao à/ I’m going to the beach with a girl. – ไปเที่ยว / bpai tîao/ means ‘to go out for pleasure’. – สาว / săao/ means ‘girl’ usually refers to young girl used in casual spoken Thai. เท่ห์ป่ะ /tây bpà?/ Do I look cool? วันนี้เท่หวะ /wan-níi tâu wà/ You look cool today. – หวะ /wà/ is an informal particle used for emphasis. – The word เท่ meaning ‘cool’ is written without ห์. There are a lot of confusion on the spelling of this word, including me. – *** โม้ /móe/ in Central dialect means ‘to brag’ or ‘to boast’. A boastful person is called ขี้โม้ /kîi-móe/. 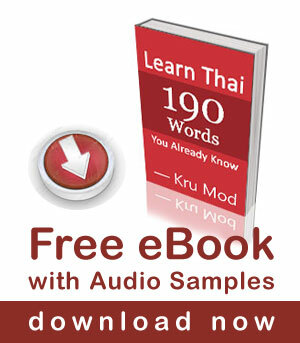 However, in Southern dialect (My family is from the South of Thailand) โม้ /móe/ also means ‘to lie’. ไปแล้วนะ/ bpai láew ná/ is an expression ‘ I gotta go’. If you have any questions, feel free to post them in the comment section below.